Sudhanshu Saini from Bhopal, B.E. - B.Tech Graduate. 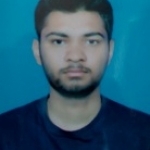 Sudhanshu Saini is Software Engineer and currently have no work experience. C/C++ JAVA DATA STRUCTURE & ALG.. DBMS COMPUTER NETWOR.. MACHINE LEARNING OPEARATING SYSTEM PH..
are one of expert skill area's of Sudhanshu Saini . Sudhanshu Saini is working in IT Software industry.